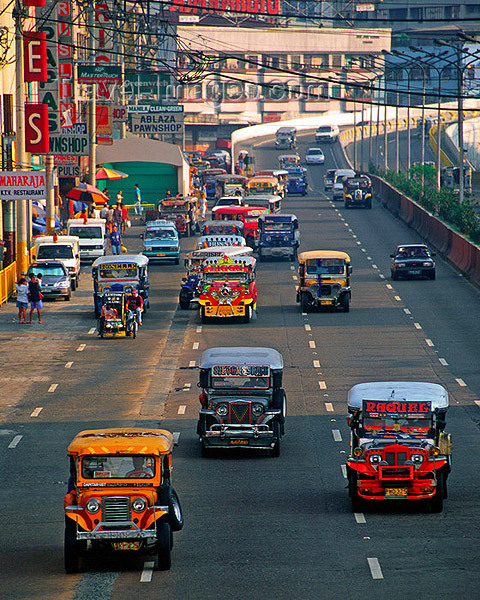 The Jeepney is the iconic and most common form of transportation in the Philippines. 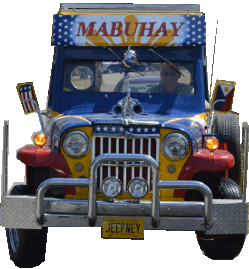 Initially when converted from US jeeps, the jeepneys could only ride six passengers, three on each side. But as time passed by, the length of the jeepney has extended equivalent to a light truck. There are jeepneys today, which can accommodate 30 or more passengers. Under the hood of the original jeepneys were Willy’s gasoline engines with 4-wheel drive. But, the modern jeepneys today, have Isuzu diesel engines with 2-wheel drive. The chassis are longer and locally manufactured. An exceptional point about jeepneys is that no two jeepneys look exactly identical. Each jeepney can be customized, from the airbrushed art and stickers, the accessories to be placed on the hood and the colors to paint on the vehicle. Even a stainless steel body can be ordered if one wishes. It will all depend on the owner of the jeepney.